Toyama Bay, Japan – A giant squid was spotted swimming under fishing boats and close to the surface of Toyama Bay on Christmas Eve. The creature hung around the bay for several hours before the owner of a local Diving Shop guided it back to the ocean. A group of fish men first noticed the 13 feet invertebrate wondering around the boats in the Japanese port. Akinobu Kimura, a diver and owner of Kaiyu, a local diving shop, later led it back into deeper sea. Kimura said his curiosity had been way bigger than fear, so he decided to jump into the water. He approached the sea creature and helped it go back to the ocean. “This squid was not damaged and looked lively, spurting ink and trying to entangle his tentacles around me […] I guided the squid toward to the ocean, several hundred meters from the area it was found in, and it disappeared into the deep sea” Kimura said in an interview with CNN. Kimura narrated the experience on local TV. He said its suckers had been so strong that he had even felt some pain while he escorted it back to the sea. He added that even though he was trying to let it escape from the port, it had wrapped around his body and clung to his arm. Scientists call the giant squid spotted “Architeuthis”. It is described as one of the last mysteries of the ocean, not only because of its rare public appearance but also for being part of a world so hostile to humans that it has been little explored. Toyama Bay has been known for being home to Firefly squids. Yuki Ikushi a curator at the Uozu Aquarium informed that according to latest reports fishing nets trapped a total of 16 Architeuthis squids last season. 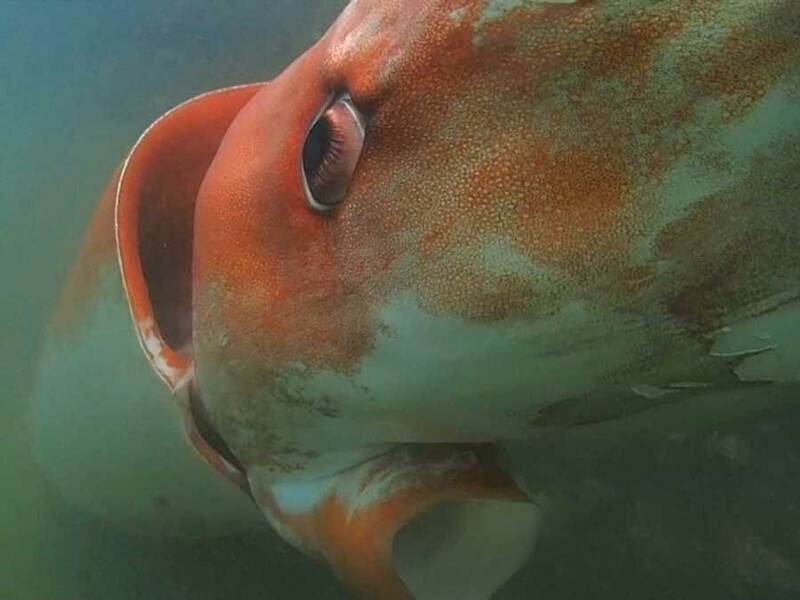 Giant squids are very rarely seen especially in such shallow waters, so this opportunity allowed tourist to captured the giant squid on video using a high-end submersible camera. Experts say that they are expecting to see more giant squids this season. However, Ikushi said that even though seeing several squids during a particular season is quite normal, watching them swimming around the moorings of the fishing boats is extremely rare.